This post was scheduled to go up a while ago but my domain messed up and all my posts scheduled on my blogging break haven't gone up! 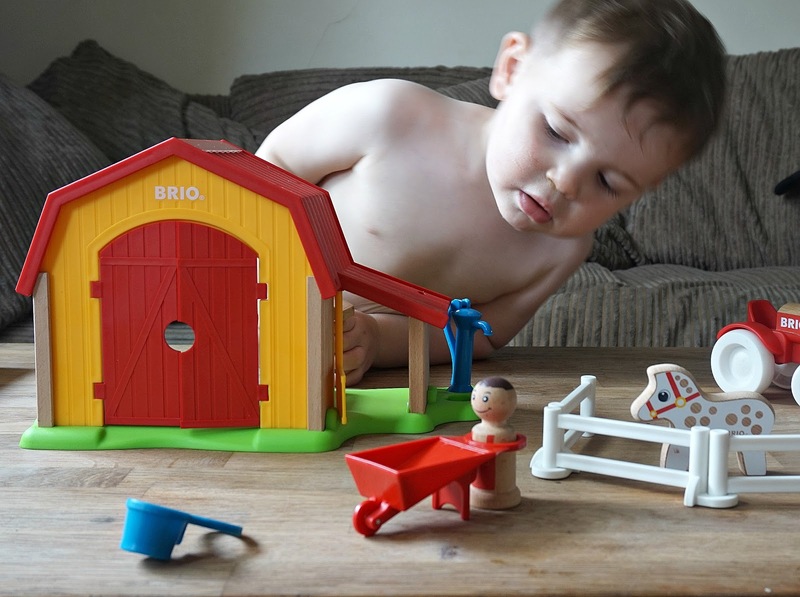 But here we have a gorgeous wooden farm set from Brio that they kindly sent us. The boys have honestly absolutely loved this form the minute it came through the door, especially Lawson he loves pretending to feed the cow and opening and closing the barn doors. Oscar already has an amazing imagination and loves role playing with the farmer, I love watching them play so nicely together. 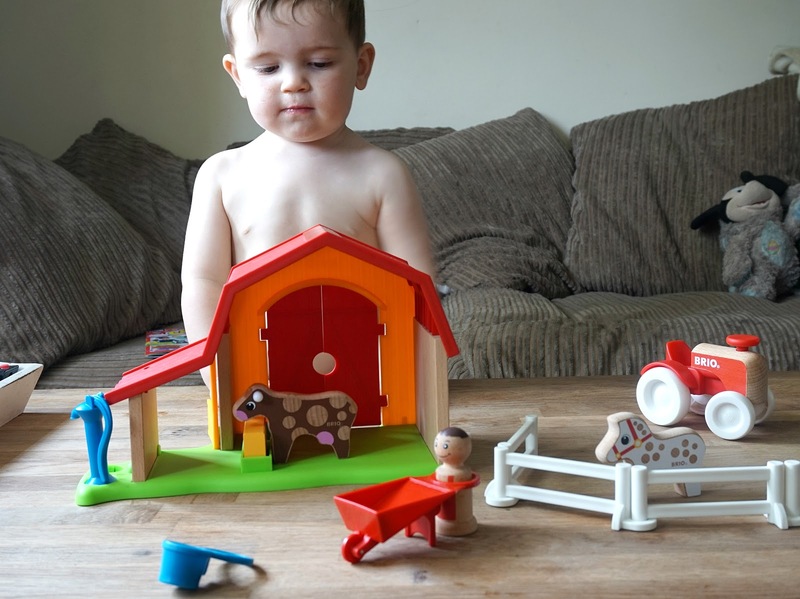 Lawson will be feeding the cow whilst Oscar is playing with the farmer, Oscar is talking away and making scenarios in his head its amazing to watch, I wish I filmed it now for my youtube which I really want to get back into. I love how bright and colourful this set is and it is so sturdy, the pieces are perfect for little hands but not too small for me to worry about Lawson wanting to put anything in his mouth, he's over that stage now but you never know. 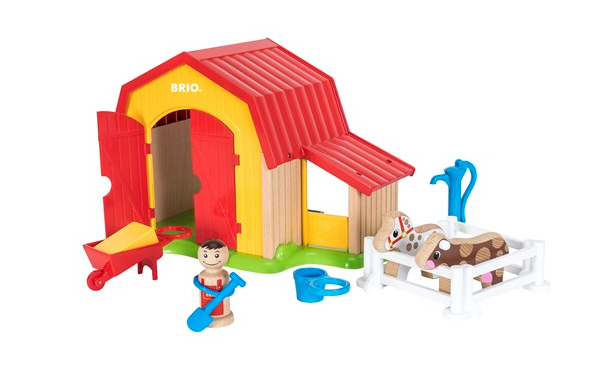 I loved wooden toy I always have and Brio have that more elegant touch to a wooden toy I think. They boys have even loved playing with the toy they got a while back with this farm set as it ties in so well, the tractor, which we reviewed here a while back. This toy is great for hand and eye coordination, character play and just stimulating their minds with all the colours, touch and imagination. We got this toy a few weeks back and Lawson always gets it out of the box upstairs and plays with his animals. 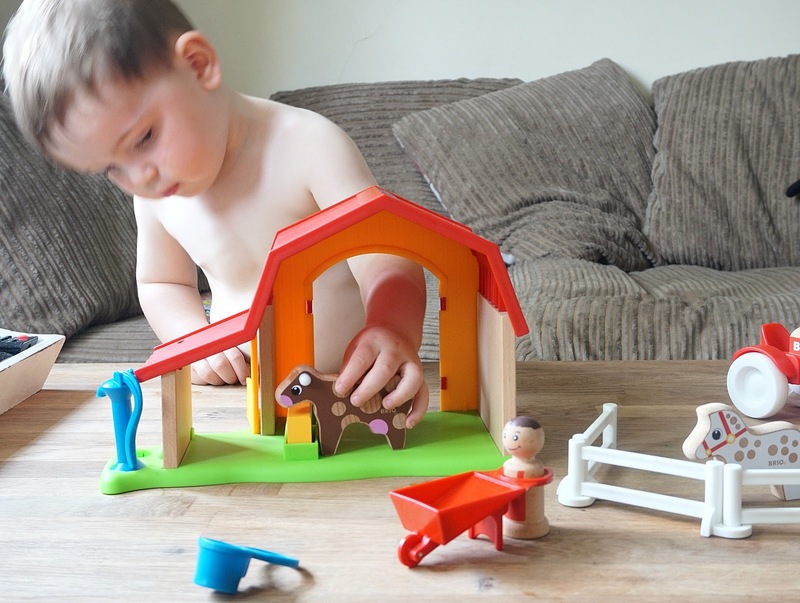 It comes with a cow, horse, farmer, barn and accessories to use around the farm because the farmer needs to muck out the animals and keep them safe in a fence. I think this would be a great present for a child especially one who loves their animals or anything to do with farms. Whilst we was playing this I also got Lawson to practise his farm animal noises, asking Oscar what other animals you would find on a farm and talk about what they like to eat etc. You can make playing a learning thing too or just get into character and have hours of fun with your children singing Old MacDonald! only truly beautiful dresses prom dresses with cyrstals are meant for a beautiful lady like you light blue prom dresses uk! Treffen Sie die und sehen Sie alle schönen Kleider! Es ermöglicht Ihnen, den Nervenkitzel und die Aufregung der Abdichtung ein Engagement für einen geliebten Menschen zu erleben. only the most beautiful jadegownshop were can i get a dress reviews made in the shipley area are meant for a perfect beauty like you!